What's your name? My name is ...... Nice to meet you. How are you? I'm .. hungry, tired, cold, sad, happy, great, good, OK.
何歳？　How old are you? What's the weather like? / How's the weather? It's..... rainy, cloudy, windy, snowy, sunny, fine, hot, a beautiful day. ○○は好きですか？　Do you like food? 動物は好きですか？　Do you like animals? Do you haveの紹介　Do you have any pets? "Do you have ....? ", "I have a ...."
I have a ... dog, cat, bird, mouse, chicken, sheep, cow, pig, elephant, monkey, snake, tiger + the sounds they make. 兄弟は何人ですか？Do you have any brothers or sisters? "What can you see? ", "I can see a ..."
"Put on the ..." ; "Draw a ...."
How many ... do you have? How many .... do you have? サッカー！頑張れ！ Come on, Come on! Can you ... kick, pass, shoot, save, catch, throw, head, score? できる、できる、できる！ I can do it! 国 Where are you from? Where are you from? I'm from...... America, Australia, Britain ( and constituent countries), China, Canada, Korea, New Zealand, Japan + any other countries that are relevant to the children's lives. どこに住んでいますか？ Where do you live? "Where do you live? ", "I live near the...."
○○は英語でなんですか？ How do you say ? フォニックス "o"の音 + "on" & "off"
時間: What time is it, Mr Wolf? What time is it? it's 1...12 o'clock. スポーツ What sports do you play? のりもの How did you get here? 色：　What colour is Christmas? 好きな色はなんですか？ What's your favourite colour? 好きな味は？　What's your favourite flavour? I like ... ice cream flavours. 好きな〇〇は？　What's your favourite ... ? What's your favourite ... ? movie, sport, cartoon, video game, pet, food, comic book, TV show. どこへ行く？　Where are you going? 動詞：　What are you doing? 何をしたい？　I want to .... + 動詞　What do you want to do? 何になりたい？　What do you want to be? 何になりたい？　What do you want to be for Halloween? Same "I want to be a ..." + Halloween outfits! 職業：　What do you do? 形容詞: I have a question! 形容詞: It's not bad, it's good! I'm thirsty. Would you like a drink? Yes, please! I'd like an orange juice, a glass of milk, a cola, a lemonade, a cup of tea, a hot chocolate, a milkshake. ○○ください！ What would you like for breakfast? I'd like some bacon, ham, eggs, bread, cereal, pancakes, fish, salad. I'd like some... apples, bananas, cheese, doughnuts, eggs, fish, grapes, hot dogs, ice cream, jelly, ketchup, lettuce, mayonnaise. bigger, smaller, slower, faster, cheaper, "Is this OK?" Where's the... toilet, phone, TV, teachers' room, computer, piano, CD player? 前置詞: Where is the spider? 前置詞: Where is Mr Monkey? 前置詞：　Where are the Christmas presents? 部屋 Where is Baby Monkey? Is he in the ... kitchen, living room, bathroom, bedroom, dining room, garage, attic, garden. 部屋 Who is in the haunted house? Who is in the .... + kitchen, living room, bathroom, bedroom, dining room, garage, attic, garden. ○○はどう思う？ What do you think of ... ? What do you think of ...? I think it's/he's/she's good, great, cool, excellent. Happy Halloween! "I'm scared", "Look, there's a ..."
Give me .... + body parts + foot/feet etc. "What would you like for Christmas?" "I'd like a ..."
Excuse me, where's the ... ? I have to ... I can! 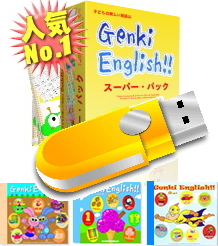 See the Genki English Hip Hop themes.